Tonight, a great NFL matchup will take place at the cold and deadly Lambeau Field, when the Dallas Cowboys will try to continue their four-game winning streak which their two rookies have spear-headed. They’ll bring along with them their very productive offensive line, and a strong defense which is playing way above expectations. The Green Bay Packers are coming off a bye week and also have just one loss on the season. It will be a tough task to keep streak going as Green Bay has beat the Cowboys in their past four meetings at Lambeau field, and took the past five meetings overall. The Cowboys will come into this after getting a convincing win where they outright dominated the Cincinnati Bengals. Since Dallas does not have Tony Romo, they are instead being led by rookie Dak Prescott at the QB position, who hasn’t thrown an interception yet, in five straight games to start off what looks like a promising career. Ezekiel Elliott is starting at running back, and is currently leading the NFL going into Week 6 with 546 yards on 109 carries. Green Bay is playing host, and goes into this competition, as the best team at stopping the run this season. They are allowing only 43 and under yards per game, rushing on 86 attempts. This matchup will be an interesting contest, since this is the real test to see just how improved this Cowboys team is, and if they can beat a really good team before their bye week next week. So this is why this game is being the top game to watch tonight, since it will the top rushing offense in the league versus the number one run defense. Elliott is currently leading the NFL in several categories such as rush yards with 546, yards per game average with 109.2. He has 5 carries of 20+ yards or more, and 31 first downs. He’s got 412 yards in the past 3 games, but what has to be considered is the defense he’s played against;h Chicago, San Francisco and Cincinnati all who rank in the lower third in run defense. So how will he fair against a strong defensive team? Green Bay has an extraordinary run defense, and its their strong suit defensively. They have only allowed 171 yards over 4 games, 42.8 per game on a 2.0 yard per carry average. It’s amazing to think that the longest run given up is 14 yards. This will be Green Bay’s toughest test so far too, while the Packers were able to hold Adrian Peterson in check in Week 2 against the Mnnesota Vikings, they haven’t faced another really good rushing team yet, since they’ve only faced the Jaguars, Lions and Giants up til now. If the Cowboys want to win they’ll have to do a few things well, and that’s run the football: As stated earlier, Elliott leads the NFL in rushing and the Packers have been able to stop the run the best in the league this year. If there are any cracks in their defense, something will have to give in this game since its the Pack’s toughest challenge so far in 2016. The Cowboys will have to keep the defensive pressure on: which means they will have to be strong on defending the pass rush like they were last weekend, since they are facing one of the best quarterbacks in the league in Aaron Rodgers who if given the space will do a lot of damage. Keeping him at bay is a very tough task for the Cowboys defense and it will be their toughest-fought game of the season to date. The Cowboys’ defensive backfield has been playing well as of late, but they know they will have their hands full with Rodgers. Another things is the health of Packers running back Eddie Lacy, who might not be healthy enough to play which could be a great advantage for Dallas. For the Dallas offense, the question will be can the line block solidly and long enough against the top run-stopping defense, to allow Elliott to get his fourth straight game of over 130 yards rushing per game? If Green Bay stops Elliott, they will surely win this NFC contest. So, if the Packers want to win they’ll have to tie up some loose ends: They’ll have to improve their overall offense since they are 12th in points, 25th in total yards and 27th in passing yards per game in the league. They’re defense has allowed them success not their offense. Aaron Rodgers is only completing 56.1 percent of passes with nine touchdowns, but he has three key interceptions. Definitely Rodgers is way better than his play in 2016, but his lack of consistency compared to most years is a concern. The Packers had a slow start on paper but are still very talented offensively and need to ignite it. 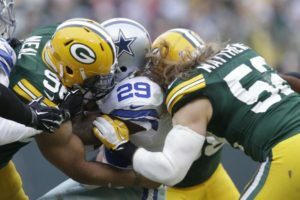 They need to make their defense slows down the Cowboys momentum: Dallas has a lot of momentum coming into tonight’s game, but the Packers have to slow down the best aspects of the Cowboys’ game. That’s obviously their rushing game and how they control the tempo of games when they have a lead. If Green Bay can force some three-and-outs and pressure Prescott hard maybe eve getting a sack, then they will be able to get a relatively easy win at home. Green Bay needs to stick to its homegrown brand of keep-away demands and precision play from Rodgers and, despite Dallas’ defense being ready for all types of challenges this season, the secondary might be overmatched if the Packers’ offensive machine starts busting out first downs. The Cowboys do have a winning formula and will have to win the fourth quarter if they want to win the game. Rodgers still doesn’t look his best, so this is the smallest of windows for Dallas to steal an important win.